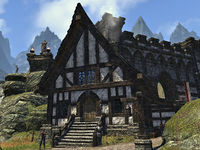 Kardyn's Home is a small, single-room Breton-style house found in Alcaire Castle. The house is locked with an advanced lock and a safebox can be found to the right as you enter. This page was last modified on 7 November 2018, at 13:30.